How will this Report Help My Company ? after checking out the contents, have ordered their copy of this comprehensive strategic report. 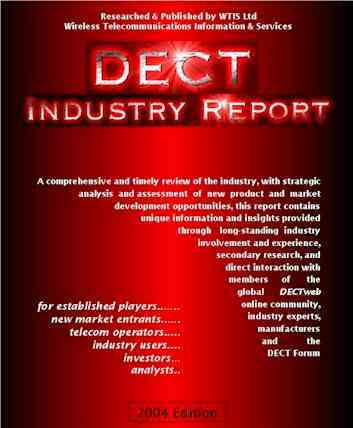 At over 600 pages and 140 exhibits, this report provides a comprehensive and detailed survey of the DECT industry – its structure and suppliers, at all levels of the value chain, markets, technology and future potential – that imparts a solid understanding of the present status and future evolution of the industry. The information herein will benefit a wide range of industry stakeholders, assisting in the development of future business, market and investment strategies. Rather than simply providing today’s market statistics, the report examines the factors that will influence future market development and encourages companies to use such insight not simply to forecast but to shape that future. The Financial Community - The report presents its findings in a way that will enable those involved in financing and monitoring the wireless telecoms industry to understand where DECT fits in an increasingly complex picture of wireless technologies and markets. DECT is today a consumer mass market, at a time when wireless LAN and VoIP have emerged as disruptive technologies. Will VoIP over wireless LAN supplant DECT ? Does DECT, as a mature technology, still have growth potential – indeed is it perhaps underestimated ? If your company is considering a DECT-related investment you need this report. Major Telecom Manufacturers - Telephones are the most pervasive consumer electronic product the world has yet seen. With the transition from wired to wireless in the residential and commercial markets, no major telecommunication manufacturers is without DECT products within their residential and enterprise portfolios. Major new geographical markets are opening to DECT, and future ones remain. To maintain profit margins in maturing markets requires continuing product evolution, a challenge that the DECT leaders are rising to, with new IP products and high end multimedia phones. The latest standards development - Open Data Access Profile, SIP interworking and more - is set to allow further product innovation. Telecommunications Network Operators - In the developing world, DECT has seen some limited success as a wireless local loop technology; its success in this market has however been far less than anticipated in the mid-1990s. In developed markets, fixed mobile convergence is being re-examined by network operators in the form of GSM-Bluetooth and GSM-WiFi; but where does DECT fit in this picture ? Are such developments a threat or opportunity and how should operators view the role of DECT in this picture ? What are the lessons to be learned from recent failure of dual-mode GSM-DECT services in the UK and Germany ? What factors have changed and what are the same ? What are the preconditions for success for FMC ? New Market Entrants & Niche Suppliers - The continuing migration of residential telephony from wired to cordless has attracted new entrants, many from Asia. Such new entrants have not confined themselves to the residential cordless market, but are also addressing business systems and niche markets. What are the opportunities for new entrants to the DECT market ? The forecast market growth remains significant – what are the factors that will influence these markets, and how should these influence strategy for a new entrant ? Suppliers of Competing Technologies - Companies that have developed capabilities in Bluetooth, Wireless LAN or ZigBee potentially have the ability to impact the DECT marketplace. To date, with some notable exceptions, most such companies have maintained focus on their original target applications. As competition toughens however, these companies are needing to better understand why DECT is such a strong competitor and how it is that the technologies may play out in different markets. Distributors - The distribution chain for DECT products varies significantly geographically. Thus, whilst generalities are dangerous, it is true to say that there are still new opportunities for distributors, as DECT addresses new geographical markets and as new entrants seek to gain access to established markets.